Let’s take a trip to the spiritual home of gambling to check out this online slot from Openbet. It’s called Fabulous Vegas Nights and its a colourful adventure into the Nevada desert. To add to the entertainment it has two separate bonus features and the chance to win the big bucks with three different sizes of progressive jackpot. 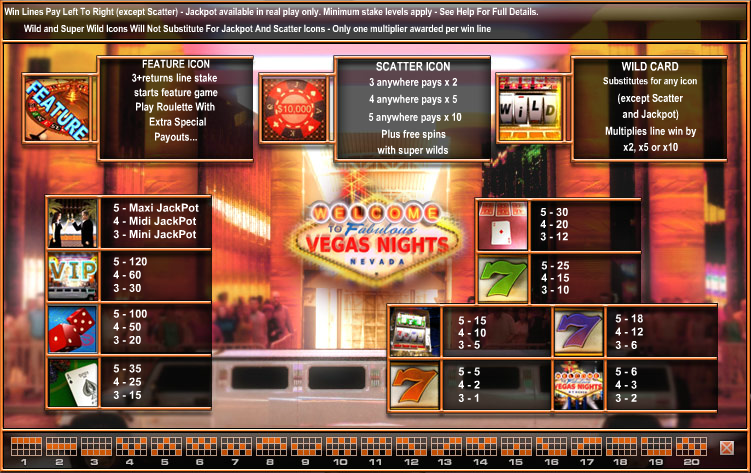 Fabulous Vegas Nights plays out over five reels and up to twenty paylines; behind the reels you can just make out a Las Vegas street scene and all the symbols are related to the theme. They include a Vegas Nights sign, red and purple sevens, a traditional slot machine, an Ace of Spades, an Ace of Diamonds, a pair of dice, a VIP sign and a couple with glasses of champagne. Special symbols are a roulette bonus, a $10,000 casino chip scatter and a set of reels displaying ‘Wild’. Trigger this game by landing three, four or five of the roulette wheel symbols from left to right starting at reel one. You will get to play a mini form of roulette with some supplied chips. You’ll get a maximum of three spins and the multiplier applied to your wins will be 5x, 10x or 15x depending on how many symbols triggered the feature. Landing three, four of five of the red casino chip scatter symbols anywhere on the reels will trigger the free spins round. As you cans see from the video above, first you need to pick from the question mark symbols to determine the number of spins awarded. When you find ‘Start Free Spins’ the picking is over and the spins begin. Super Wilds are added to the reels now and these have a number attached; land one and it will remain in place for that number of spins. More spins can be earned by landing more scatters – if this happens the picking process starts again. 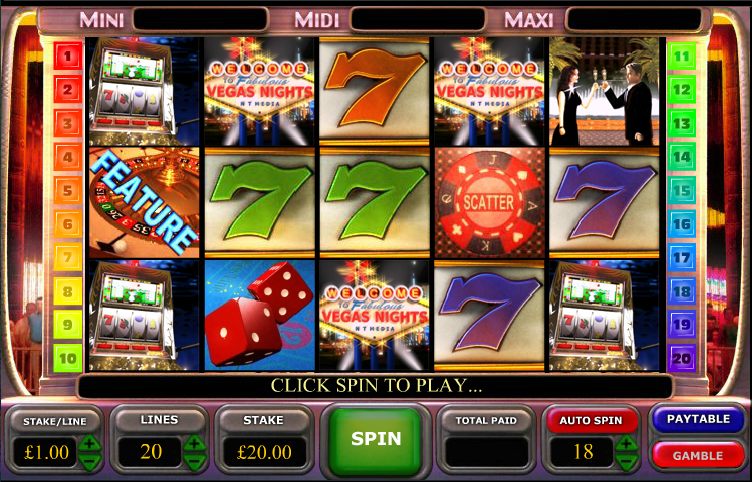 There are three separate jackpots – Mini, Midi and Maxi – and you can see the current totals above the reels. The symbol with the couple toasting champagne is the key here and landing three, four or five on a n active payline will win you the respective jackpot amount. If you’d like to gamble your last win on a turn of the playing card you can do so; just click the ‘Gamble’ button below the reels after a win and try your luck at doubling or tripling that amount by correctly predicting whether the next card will be the right colour or suit. For the best chance of winning the progressive jackpot, make sure you have all paylines active – the symbols must land on a winning payline. If you’ve played other Openbet slots such as Caribbean Nights or Astro Fruits then the format is pretty similar; still, it’s an entertaining enough game with plenty of features to keep you occupied.